Precious coral is a species of coral that grows on the rocky seafloor, typically in the murky depths of the ocean or in dark undersea caverns. This gemstone forms through a biological process that can take thousands of years. Coral is a branching skeleton-like structure built by small marine animals known as coral polyps. The coral skeleton is composed of hard calcium carbonate colored by carotenoid pigments. With shades of delicate pink and intense red coral is an ideal gemstone for making jewelry that is rich in emotion and charm. 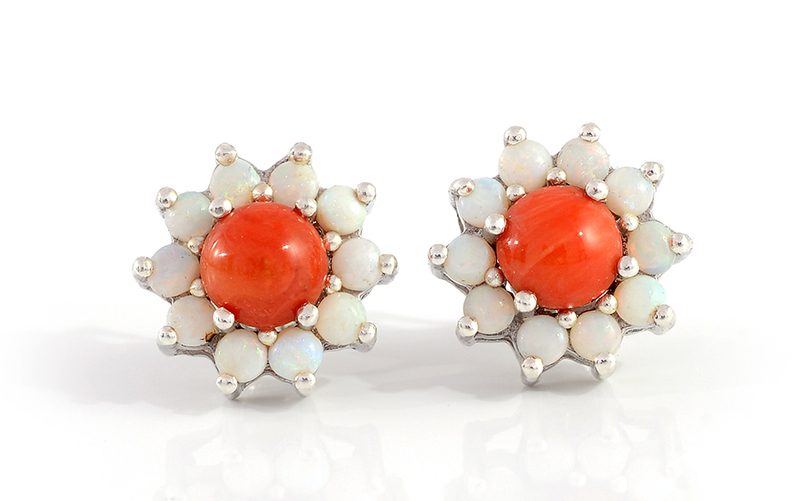 Mediterranean coral is extremely rare and highly sought after. Coral has long been used as a decorative material. It embodies man's longing for the summer sun and far-off oceans. 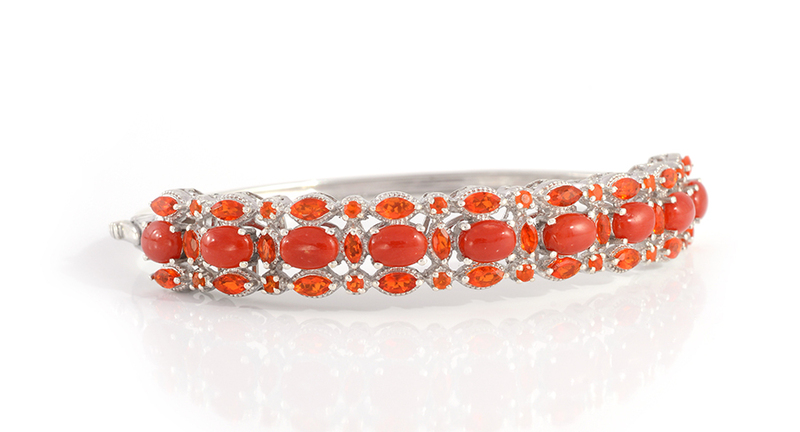 Mediterranean coral is a stunning organic gemstone known for its vivid deep red-orange hue. With an irresistible color, Mediterranean coral jewelry adds a splash of summer sunshine to your everyday look. Is Mediterranean coral valuable? The value of colored stones is typically determined by a combination of its color, clarity, cut, and carat weight. This is no different when determining what Mediterranean coral is worth. These guidelines will help you choose coral for your collection. This organic gemstone typically exhibits a range of warm red-pink colors, ranging in hue from a beach sunset through salmon pink, to a deep blood red. However, gem-quality coral can also be found in shades of white, black, and blue. The most popular color for coral is red. Due to several environmental and legal factors, there is a drastic drop in the supply of high-quality red coral, increasing its value dramatically. 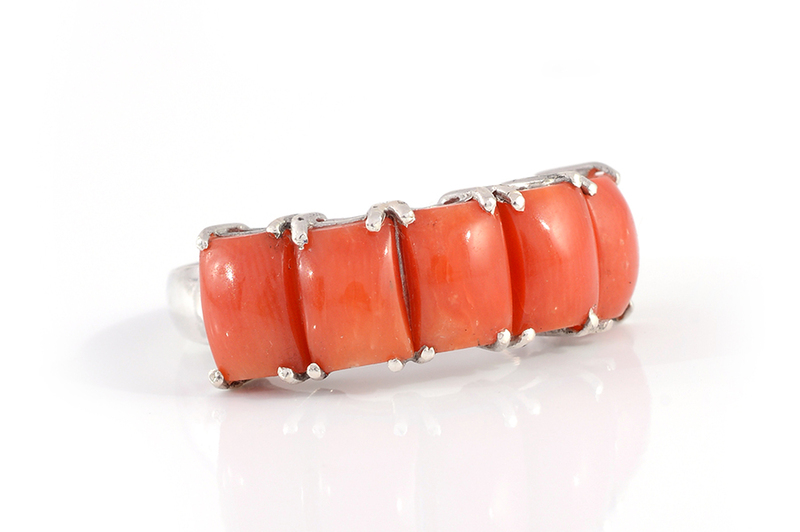 Mediterranean coral is an opaque natural gemstone and does not possess inclusions. If natural coral is found with a foreign substance, the value of coral will decrease exponentially. The surface of the stone should be clean and free of blemish or other surface damage. Coral is shaped in the form of beads, especially cabochons in a variety of shapes. It is also shaped into small sculptures such as flowers for brooches and pins and even cameos for jewelry! Small branches of Mediterranean coral are occasionally stranded into thorny, spiky dangling necklaces. As an organic gemstone, rough coral can vary widely in shape. Individual branches of material range in size from a few inches long, to several feet in length. Despite this, these branches are not always very thick. As a result, it is uncommon to find large single stones. More often, coral will be fashioned into round or cylindrical beads. 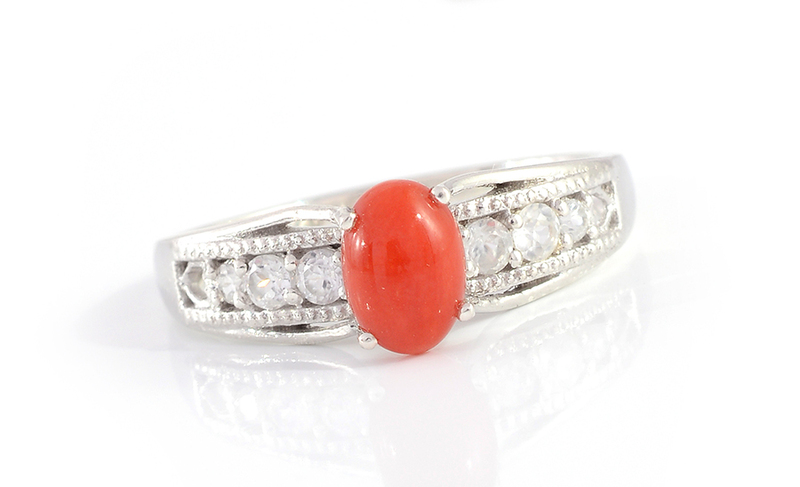 Mediterranean coral is a genuine gemstone that does not go under any treatment. Its gorgeous color and appearance are all natural. Ranking three to four rank on the Mohs scale of hardness, Mediterranean coral has a fair to good toughness. Due to its brittle nature, occasional wearing can make this gemstone jewelry last for generations. Lukewarm soapy water is the best and safest solution for regular cleaning of this gemstone. Use the soft brush to avoid any scratches on the stone and a dry cloth to soak up the moisture. Ultrasonic cleaning is a risky affair and must be avoided. Also, never try steam cleaning as it will cause the color to fade. A jewelry box or the sperate pouches are best places to safeguard your coral jewelry. Each piece should be wrapped in a soft cloth and kept aside from other gemstone jewelry to prevent any damage to the stone’s surface. Who Can Wear Mediterranean Coral? Someone looking for an elegant, forever and trendy jewelry, Mediterranean coral is an outstanding choice. The gemstone is best loved for its beads bracelets, cabochon rings, and spiky necklaces. They offer a perfect dose of color to any neutral, warm or cool colored outfit. Coral jewelry best works with whites and yellows. How Does Mediterranean Coral Compare to Other Red Stones? Mediterranean coral is opaque, bright-to-dark red, orange-red, or orange-pink, capturing a range of hues from red, orange to pink. As beautiful as the evening sun or the orange-pink Dahlia flower, this stone stands apart from other varieties. Unlike most other gemstones which are of mineral origin, Coral is organic, formed by living organisms. Consider gorgeous Mediterranean coral if you admire the colors of amber, carnelian, chalcedony, cultured pearl, jadeite, nephrite or rose quartz. Where Does Mediterranean Coral Come From? Gemstone-quality coral is related to reef-forming corals, but the most valuable variety of coral is found in the Mediterranean. Shop LC sources its coral from the coral reefs of the Mediterranean Sea. It takes thousands of years for coral to form which increases its rarity and value. The color of coral depends on the depth at which it is found. Below 160 feet means a lighter color. The deepest-colored corals are found between depths of 100 and 160 feet. How is Mediterranean Coral Mined? Today, extraction of Mediterranean coral is mainly performed by divers who collect it at the depths of 120 meters and more. In recent decades, combined factors such as over-harvesting, pollution, and cumulative national and international efforts for environmental protection has led to a drastic reduction in the supply. As a result, illegal poaching of coral has risen. Throughout the world, many nations are working toward stopping illegal poaching to save marine wildlife and homes. Shop LC also contributes in the cause by participating in an ethical supply chain process. We source our coral only from authorized suppliers. Shop LC goes to great lengths to comply with all laws protecting endangered species. What Does Mediterranean Coral Mean? Red coral is associated with feminine qualities and some Native Americans and Tibetans also associate coral with women's reproductive health and fertility. In Medieval Europe, coral was often worn by children to protect them from evil. Red coral is related to Mars, the planet of ambition, motivation and desire. Did you know many ancient civilizations believed the planet was composed of coral? Red coral is believed to be an energizer. It turns inactive people active! It invigorates determination, courage, physical strength and vitality. Some believe it helps generate wealth. Traditionally, coral has been used to treat sterility. Others say the it quiets and calms the mind to stimulate emotional healing and combat depression. Crystal healers use red coral to nourish the blood and strengthen the skeleton. It is also used to treat hiccups, colic, heartburn, and disorders of the kidneys, bladder and thyroid. For thousands of years this stone was thought to possess magical powers, protecting against evil spells, lightning and vicious people! Is Mediterranean Coral a Birthstone? Mediterranean Coral is not recognized as a modern birthstone, but this gorgeous gemstone makes an excellent substitute for ruby, the July birthstone. People associated with the planet Mars or with the zodiac sign of Libra may also enjoy this beautiful gem. Mediterranean coral ranks three to four on the Mohs scale of hardness. Mediterranean color is opaque bright-to-dark red orange-red and orange-pink. Sourced from the Mediterranean Sea. 100-percent natural stone; no additional treatments. Also known as red coral.